Just thought I'd pop off a quick post to say hello and check in. 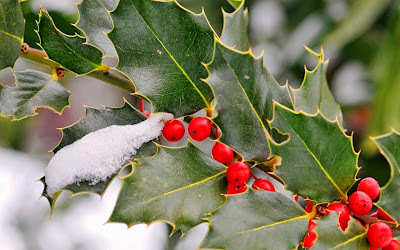 This morning I awoke to a light dusting of snow on my fence and holly tree. How pretty! It's not quite wintery yet in Nashville- some trees still have colorful leaves- but it's finally cold and it feels like winter is encroaching. I'm still trucking along on my functional medicine protocol. I'm not full autoimmune paleo, as I continue to test the waters with different foods and watch for symptoms. Some happy news: I can now tolerate chocolate without any sign of IBS, which is such a relief! I haven't been stuffing my face with it, but it's been heavenly to make a nice mug of hot cocoa or have a square of dark chocolate here and there. I've also added small amounts of almonds and walnuts back, but I haven't been eating many nuts in general. I find I don't seem to crave them as much as I used to. I've only occasionally been eating a small amount of nightshades. I don't think they affect me adversely. As for grains, I've mostly steered clear of them and plan on continuing to do so. I still have the occasional minor skin breakout (though my skin remains much improved), so I have to troubleshoot the details there. My progesterone still looks to be low, so I have added a vitex product (Nature's Way Femaprin). A neat discovery I accidentally made is that my body really likes SAM-e (S-adenosylmethionine). I had originally been taking 5-HTP to support serotonin, and then a bit of Seasonal Affective Disorder started to hit me, where I'd feel sad on dark or cloudy days. I did a little research and found that switching the timing of taking my 5-HTP to between 3-4 pm and then again at bed really made it work better. Then, I ran out and I happened to have a bottle of Cell Food SAM-e liquid (which I had mistakenly ordered, thinking it was Cell Food liquid oxygen) and I remembered that SAM-e is used for mood disorders, so I thought I might as well save myself some money and try it for serotonin support. Well, not only did it help with that, but I quickly found myself feeling WAY more motivated and downright cheerful. As I have a history of low dopamine symptoms, this is so very welcome. I've been on dopamine support for ages, and it does help, but the SAM-e has had a dramatic effect. It has also given me more mental clarity. I hope it keeps working because my house is staying so much cleaner and I'm getting a lot more done. And, finally, I'm reading a really cool book about the mind/body connection called "You Are The Placebo" by Joe Dispenza. It's fascinating and the premise is that if your mind can create placebo-based physical effects, then in understanding that process, it can be used to create healing. It makes sense: if our negative emotions and stress states can trigger inflammatory compounds and harmful epigenetic expression, can we mitigate these and reverse them by actively seeking to change the way our mind is wired so that positive mental and emotional processes produce healing epigenetic and hormonal signals? Just reading about the history of the placebo effect alone is fascinating. I will continue to keep you posted and I have some autoimmune paleo recipes that need a little nailing down, but that I look forward to posting. What great ideas! I had never thought of any of these suggestions on how to beat the winter blues. Hey Erin, noticed you haven't posted in a while, but I wanted to reach out and let you know I really enjoy your articles.